Do you know the difference between average tasting food and delicious food? It's all in the spices. Freshly ground spices that is. Grinding your spices right before seasoning your food releases a delicious flavor that is partly lost after they are grounded. Grinding spices doesn't have to be a pain. In fact, you will actually enjoy doing it from now on. 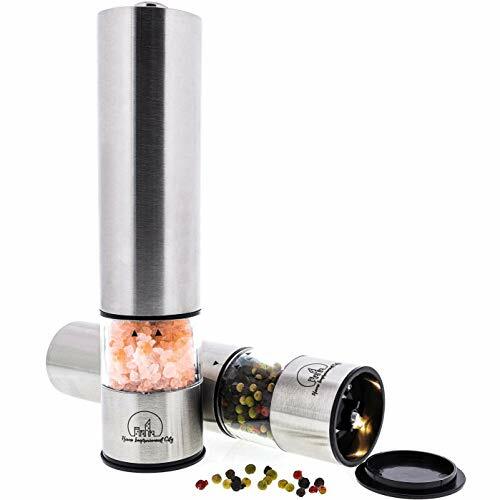 Meet the ELECTRIC SALT AND PEPPER GRINDER SET. Now, all you have to do to enjoy the taste of freshly ground spices is push a button. CONVENIENT ONE HAND OPERATION - Pushing the top button activates the grinding mechanism. ADJUST THE COARSENESS TO YOUR NEEDS - Weather you like your spices really fine or extra coarse, we have you covered. Turn the bottom knob to get the perfect coarseness for you. SEE EXACTLY HOW MUCH YOU GRIND - Have you ever added way too much salt to your food without realizing it? We all have. Now you can exercise great portion control using the LED light on the bottom. The light activates automatically when grinding. STAINLESS STEEL MODERN LOOK - Our grinders are made from high quality brushed stainless steel. They have a simple yet elegant design and will look great in your kitchen. The grinders come in color box and make a great gifts for Christmas, anniversaries, Mothers Day or Fathers Day. SATISFACTION GUARANTEED - We are confident that our grinders will transform your cooking experience. Use them for 30 days and if you do not love them we will give you a full refund. You also get a hassle free 1 year free replacement warranty with your purchase. BONUS - Free ebook included(How do we spice our food?) and a small cleaning brush. ADD TO CART NOW and get the grinding started. PUSH AND GRIND - Twisting and shaking is old news. Using the electric pepper grinder the only thing you need to do is to push a button. The salt and pepper grinders only use 4 AA batteries. You can grind any of your favorite gourmet spices from ground black pepper white green and red peppercorns to sea salt, pink Himalayan salt coriander seeds cumin seeds and many other herbs. This grinder is also a great help for people with arthritis or other joint pain issues. LED LIGHT Over seasoning is impossible because now you can see exactly how much you are grinding. The light turns on automatically when seasoning your food even in the dimmest lighting conditions. Our modern salt mill will look great on any dinner table, kitchen countertop or shelf. Say goodbye to your usual salt and pepper shaker and welcome to your new favorite kitchen utensils. Battery operated and adjustable to suit your needs, they will make cooking a pleasure. WE ARE HAPPY IF YOU ARE HAPPY - Try our electronic salt and pepper set for 30 days. If you do not love them, we give you your money back. Also, you get a 1 year replacement warranty. For best results, use quality batteries and refill the containers when they are one third full. EXCLUSIVE BONUS Order now and receive our complimentary How Do We Spice Our Food ebook and a cleaning brush to clean your grinders in no time. 磊MADE TO LAST - Our electric salt and pepper grinder set is made from the highest quality stainless steel and sharp ceramic rotors. The electric pepper mill is not just a great kitchen gadget. Unlike your usual salt and pepper shakers, the electric grinder can be used with only one hand by pushing a button. This spice set is great for BBQ, camping or a picnic. It comes in a colorful box, makes great Christmas, anniversary or wedding gifts and can be a useful portable tool for your next travel. ADJUSTABLE COARSENESS - Maybe you need fine spices for one dish and coarse for another. Just turn the small bottom knob until you reach the desired coarseness and let the pepper mills do the job. The grinders are cordless so you can move around the kitchen at will. Also, the plastic lids(caps) on the bottom avoid making a mess. You can see exactly when it's time for a refill through the clear acrylic glass. The spice container is easily refillable, fast to clean and dishwasher friendly. If you have any questions about this product by Home Improvement City, contact us by completing and submitting the form below. If you are looking for a specif part number, please include it with your message.